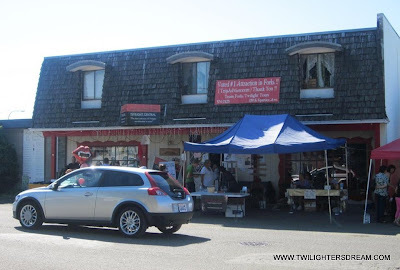 I received my tote today that I ordered from Leppell's Twilight Central in Forks, WA!!! Yay!!!! I was happy by the size of the tote. It is definitely great for carrying your books, camera and all the goodies a Twilighter would need on a Twilight Adventure. Heck, anywhere! The tote is very nicely made! The handles are sturdy and a great length to throw over your shoulder. The inside is also great. I was surprised by the amount of pockets! There are a TON of pockets all around the wall. Perfect for putting chap stick, extra batteries, pens, gum or anything you will need to carry with you. Inside is also a sturdy removable liner that goes across the bottom of the tote so it will hold it's shape and keep it upright. I absolutely love everything about this bag! It even comes with care instructions. If you'd like to see the other Twilight Tote Bags that you can order through Leppell's Twilight Central check them out on Facebook. I also want to say a special thank you to Amy of "Amy Sews" who made the bag. You are very talented. The tote is perfect and I love it! Thank you for sharing your creations with us.